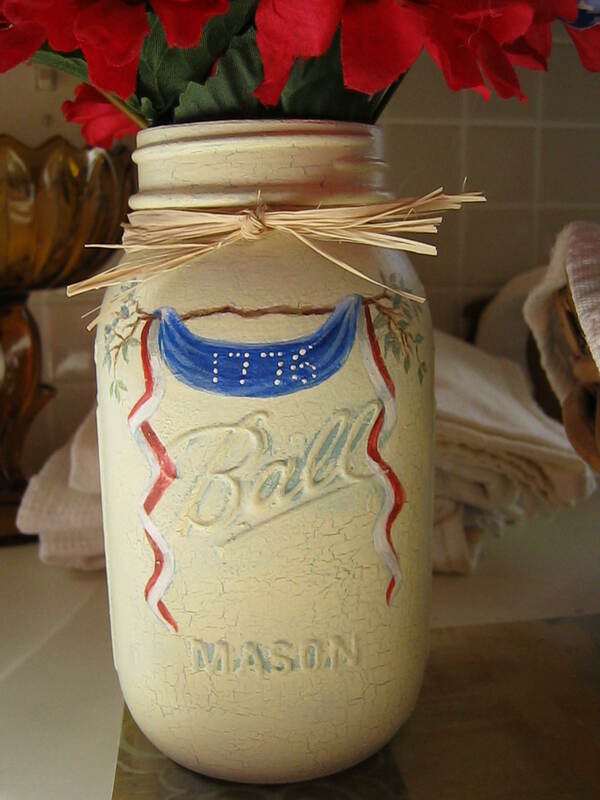 Well, I missed posting for July 4th, but since it’s still July – and I’m still celebrating – I thought I’d share my Independence Day decorated mason jar. 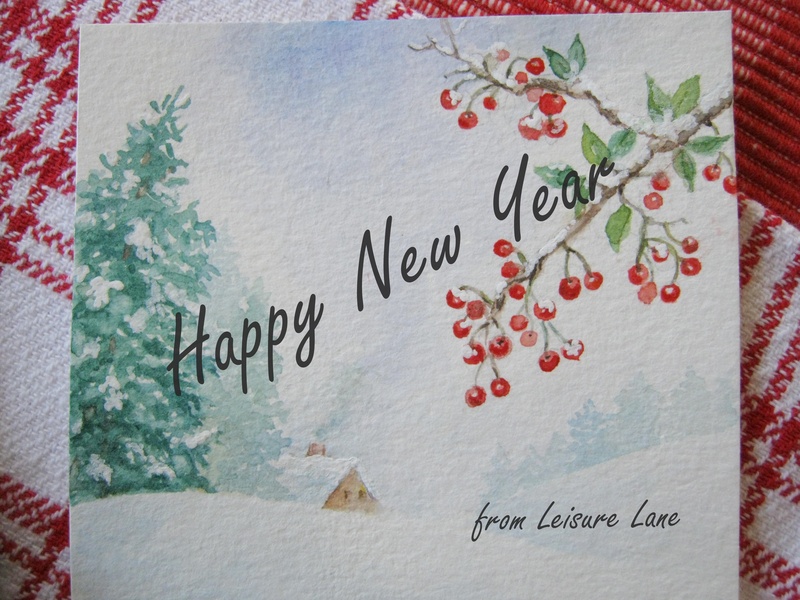 Hello, everyone, and thank you for strolling by Leisure Lane today. I hope you are all having a wonderful day full of life, liberty, and happiness. When I made this jar, I liked it so much, I decided to keep it for myself, as I don’t really have any 4th of July decor. I added some Dollar Tree floral delights (I really like the stars and stripes flowers ♥) and a flag for added patriotic flare. I had prepped the jar with paint and crackle beforehand, then painted a branch with with some stars and stripes draped over it. 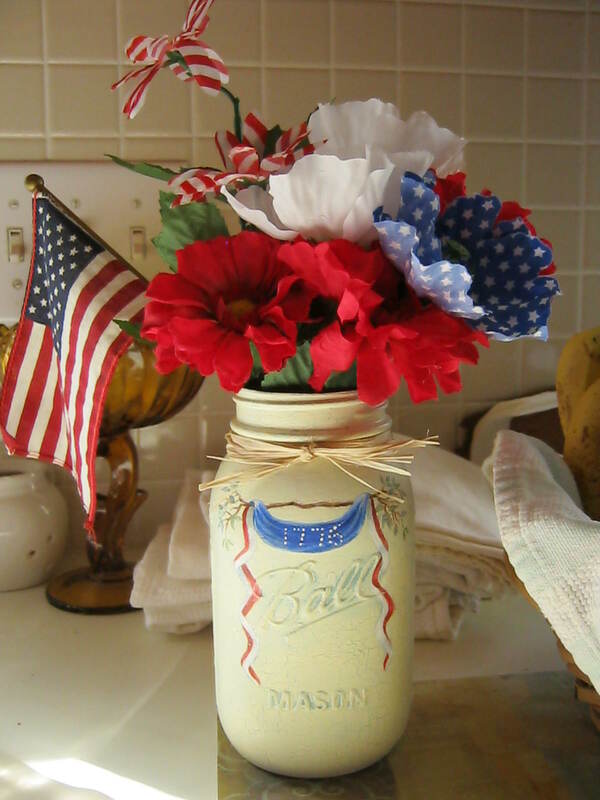 I added a raffia bow around the top and filled it with a fun and patriotic arrangement. Her sadness and forbidden woe. That pushed her into endless strife. Then mocked at all the pain they saw. Poor excuses, tongues, and all! That my sweet soul hides within me. Where only God can hear her call. Good day, Friends…and welcome to Leisure Lane! Yesterday I decided to visit my local thrift store, and though I couldn’t fit in all the sweet finds in the photo, I’d like to share a few with you today. I love pretty boxes and I pick them up whenever I can at my local dollar store. They don’t always have them, but when I see a pretty one, I purchase it. At the thrift store I found this sweet one…in perfect condition, with a garden theme. 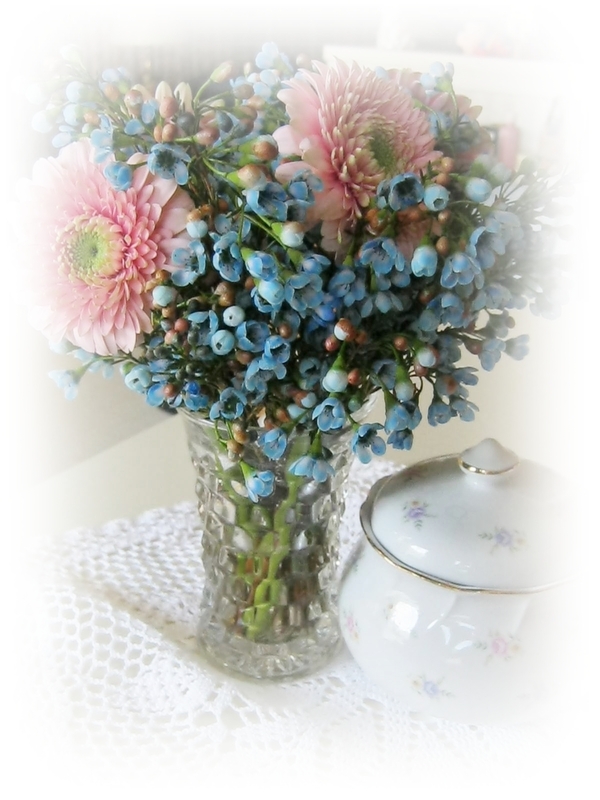 I love the soft colors, and inside the lid it reads, “Little pleasures are life’s greatest treasures”. I found a lovely cream colored tea towel…well, I believe it could be used as one…I plan to crochet the edges…it could also be used as small table topper. It’s also in perfect condition. Found some lovely ribbons, borders, as well as brocade fabrics, and a valance that I will use the fabric for making some things I’ve been wanting to try. I found an unopened package of MS Double Horse (trademark) cotton tap from Karachi, which I wrapped around a plastic holder. I can’t find any information about it on the internet, so if anyone knows what it was used for, please enlighten me. I can think of all sorts of things I will use it for, but I’d like to know its original use. 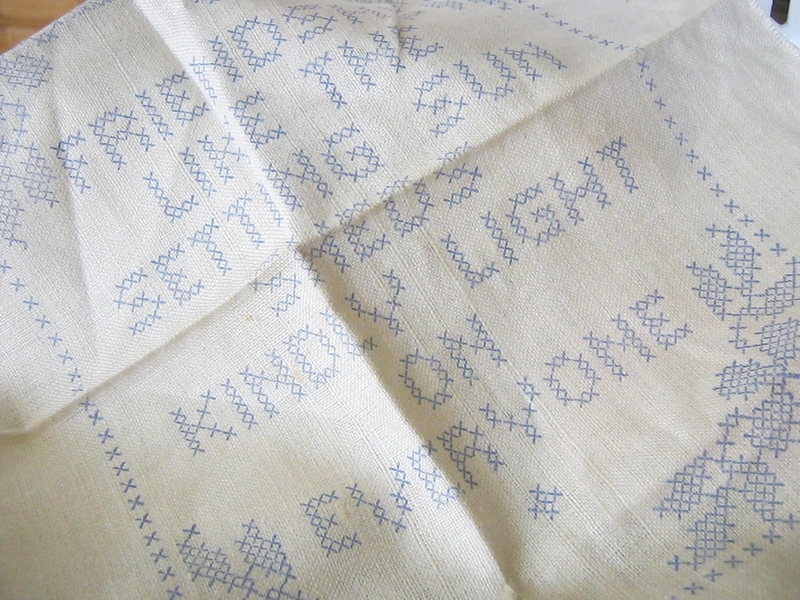 I can’t wait to begin this cross stitch I found. Isn’t it delightful? 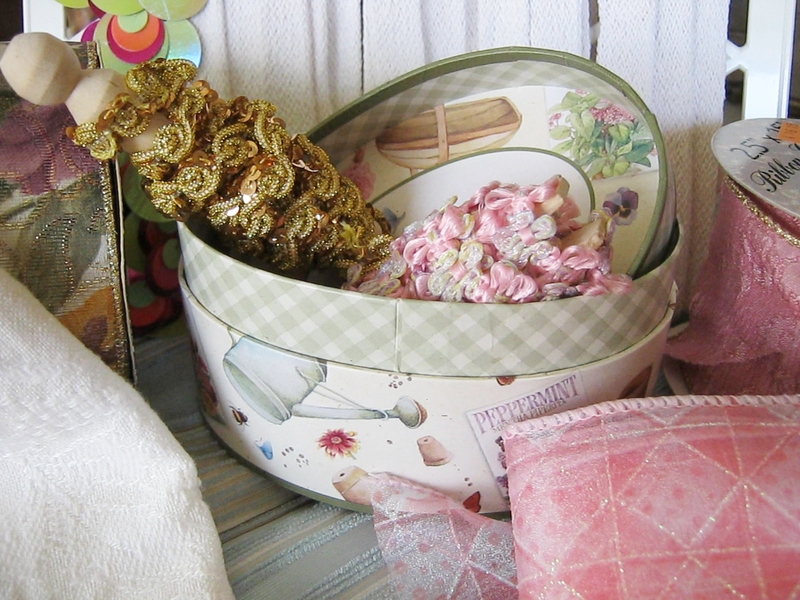 There were other things, also, like white millinery leaves, pink butterflies, a yellow gingham napkin, and more. I wish I could share them all with you, but I’m a bit pressed for time today. I’ll share what I make with them, as time goes on. In the meantime have a wonderful week, be blessed…and until next time, may happy days abound! Wishing all of you, my friends, a very blessed St. Valentine’s Day. May your Lives be filled with joy, good health, and all the radiant Love God has and wishes to give you in every way! Today I’ll be spending the day celebrating my birthday; so until next time, may happy days abound! Good day everyone, and thank you for strolling by Leisure Lane today. 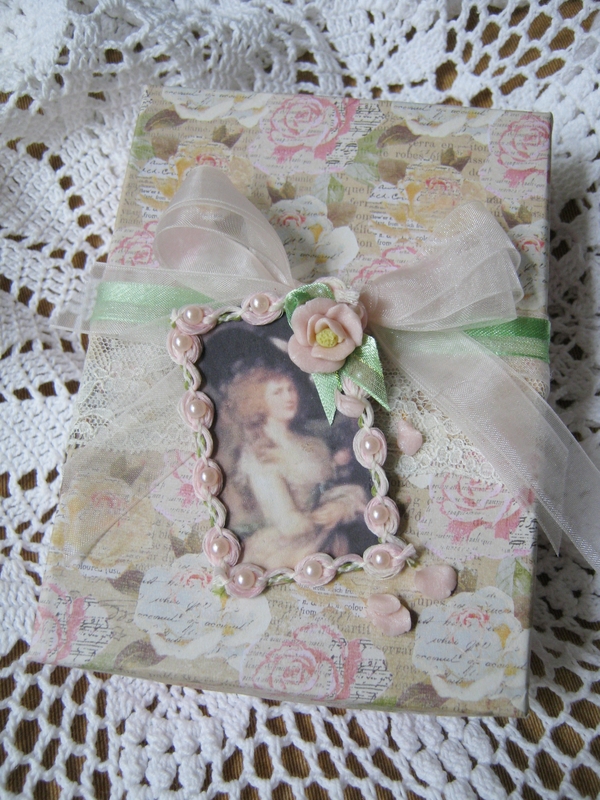 Yesterday I made a large hanging decorative card using one of the lovely vintage images I’ve been collecting. It’s not a sunny day here today, so I did my best with the photo. I certainly hope that you never give up on the song in your heart. Back in October I made a tag called “Wedding Bliss” for a couple at work who were getting married. 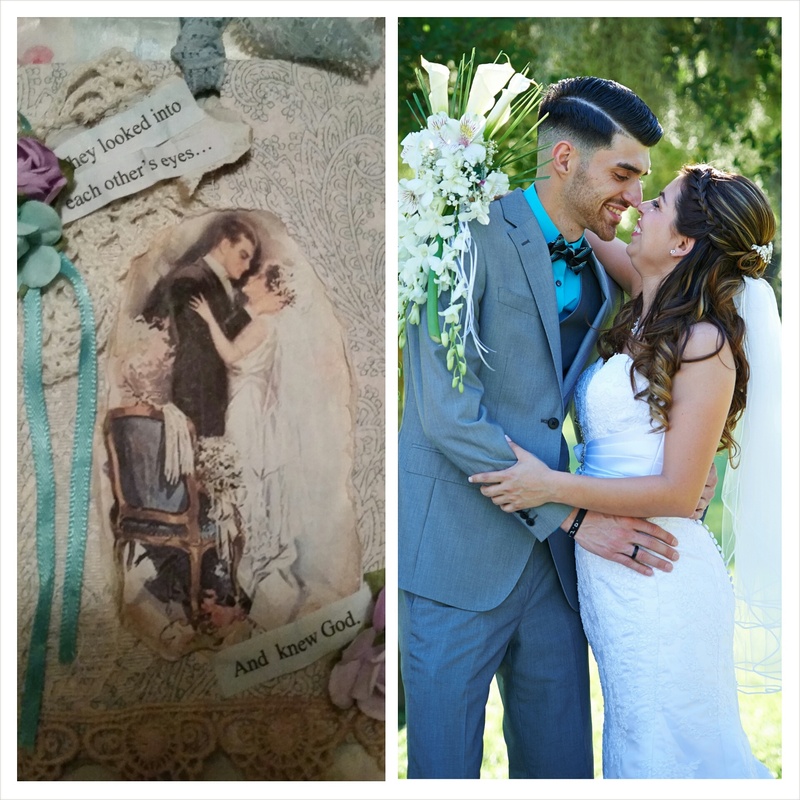 About a month after the wedding, the young woman said that she was going through her wedding photos, and happened upon the one above that resembled the image on the tag. She was so excited and put it on her facebook, and sent me a copy. I was thrilled! You never know how poignantly you may touch the lives of others. It’s playtime for Kare…well, at least she’s going along for the ride…COL (chuckle out loud). And it’s nice to have a friend who’s always on your side. 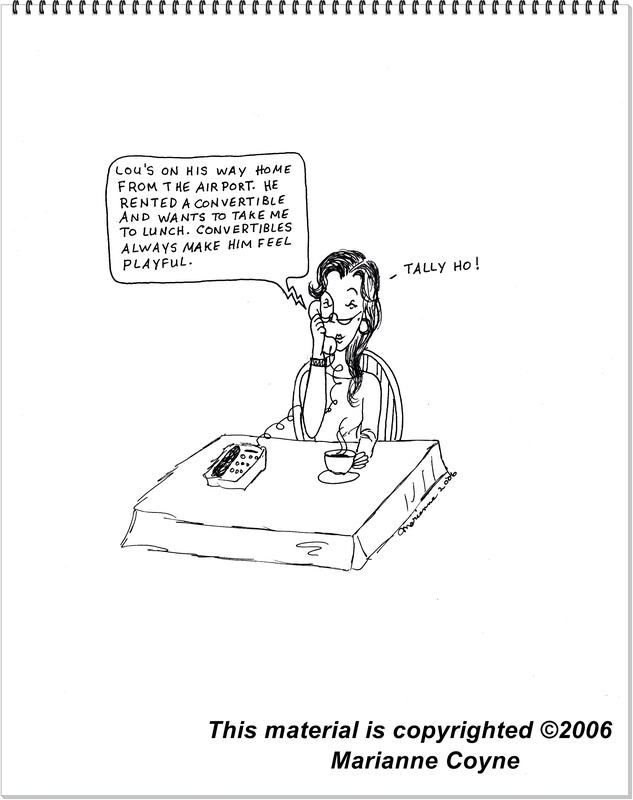 Stay tuned for part 2 of “Tally Ho”. If you’ve missed any “Kare and Mare”, or you’d like to know more about them, you can go to the Kare and Mare page and view them there. Also, Kare and Mare are now on Pinterest. You’re welcome to stop by and visit me there. 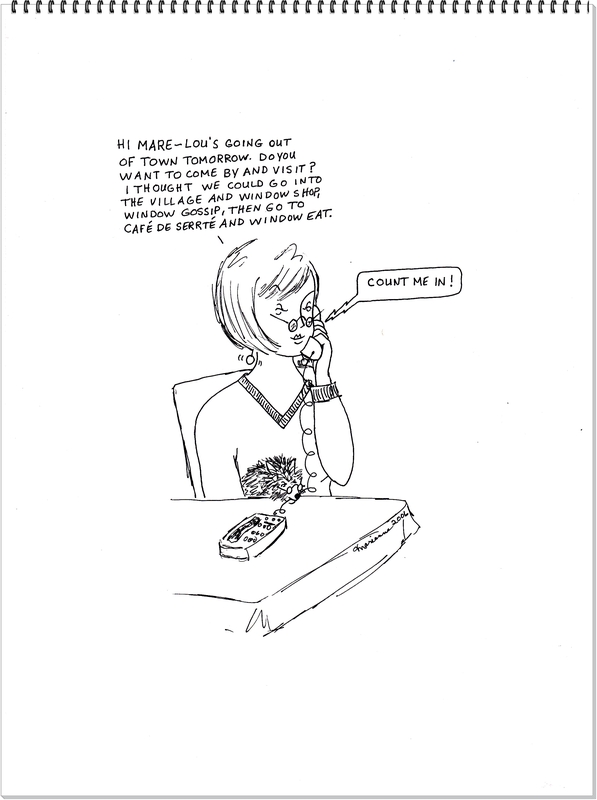 Note: “Kare and Mare” is a comic panel created by Marianne Coyne. All rights reserved. It’s been a while since Kare and Mare, so I thought I’d share some more. Everyone needs an outing once in a while, and Kare and Mare love the opportunity. Remember ‘Nilla? She’s staying home. If you’ve missed any “Kare and Mare”, or you’d like to know more about them, you can go to the Kare and Mare page and view them there. Good day Leisure Lane visitors, and welcome! I’ve been away from the computer for this week, as I’ve an injured shoulder tendon which is healing quickly, thank God! Luckily I had previously typed this post. Well, I’ve been in the process of organizing and simplifying things in my life and on my blog, and My Little Bloomin’ Shop is one of them. I don’t have a lot in the shop at the moment, and perhaps the shop will only have a few items at a time. 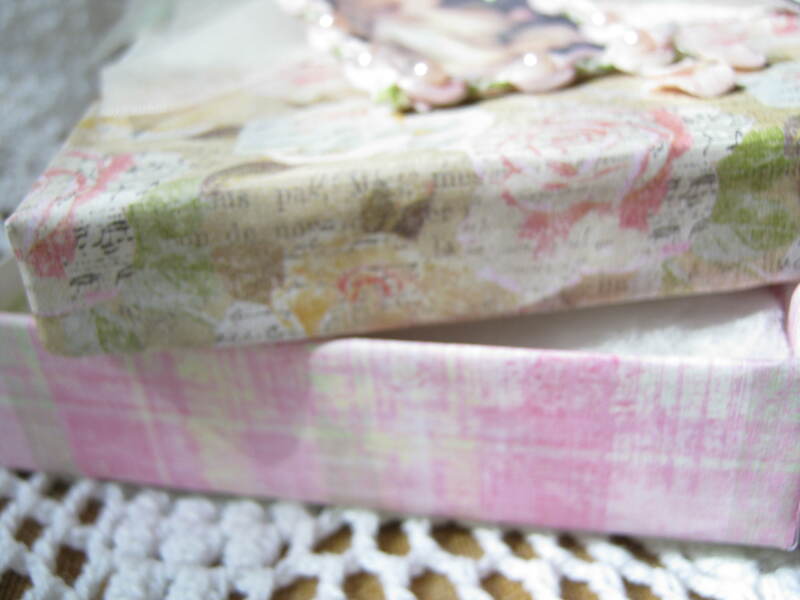 Recently, I’ve been in the process of decorating gift boxes. I’ve given some as gifts, and I’ve decided to put some in my shop for sale. They are just so pretty that I enjoy simply looking at them. They are quite cheerful. 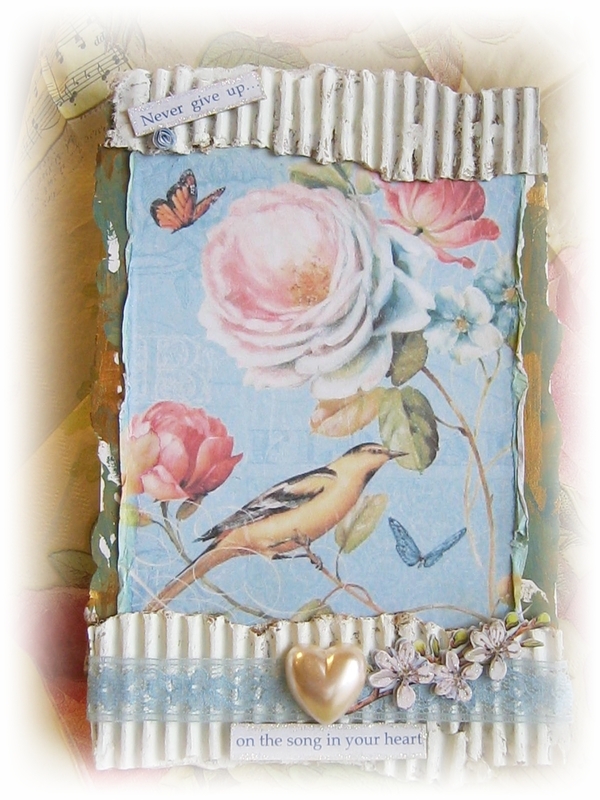 With “Softly Spring” I used a different patterned paper for the bottom that I think sets a nice tone to the piece. 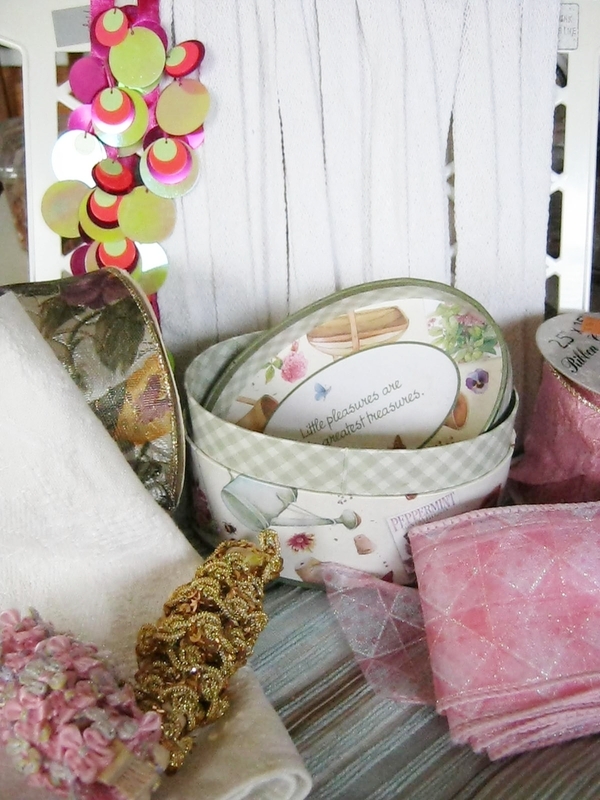 You can find “Softly Spring” for sale for a limited time in My Bloomin’ Little Shop. In the meantime, I’ll be working on some other projects as well as continuing to simplify, simplify, simplify. (Sorry this item is no longer available for sale). Thank you for strolling by. I hope you enjoyed your visit. May you be blessed today with good things and happy thoughts. 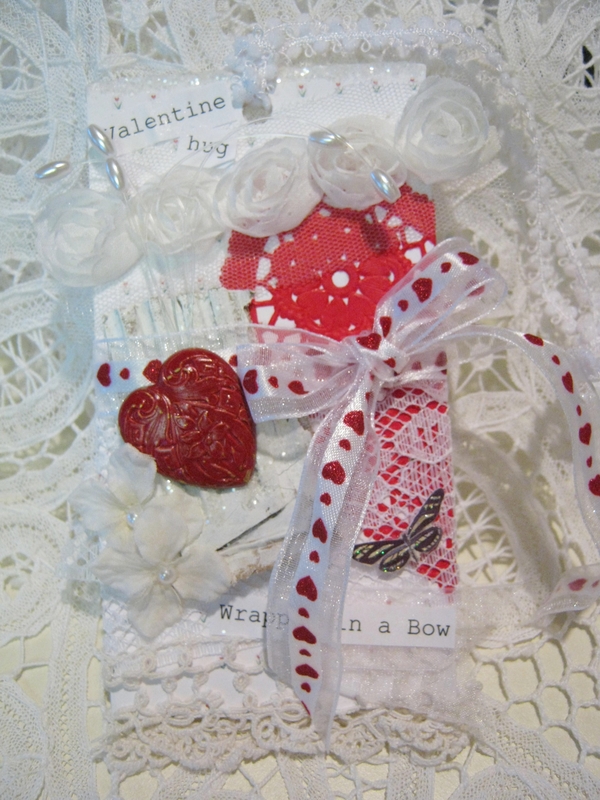 This is my last Valentine tag with the last of the heart button covers, which I made for my friend and neighbor. I used my own designed paper for the background foundation of the tag. It was such a joy to give it to her wrapped in a red and white hand-knitted potholder. I apologize for the white on white photo, but I didn’t have any of my colored items available at the time of photographing. 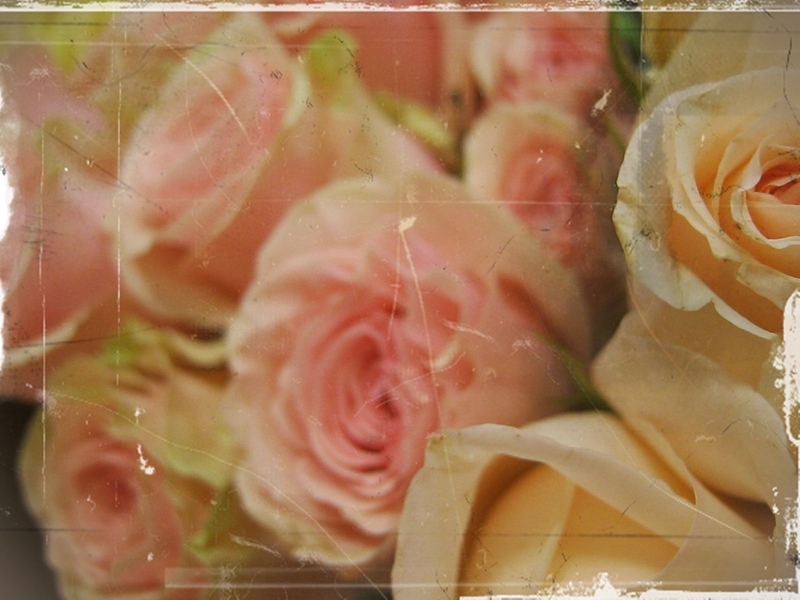 And speaking of Valentine Hugs…I’m sending one to each of you. I’ll be working on some more boxes and tags, and will share them with you as I go. Don’t forget to visit me on Pinterest, too. Thank you for stopping by. I’ll keep you posted on any cards and such I will be making available. Joining Melody for REDnesday at Brown Gingham Creations.